Cedar Rapids is divided into four quadrants that are marked by the 1st Avenue dividing the town into the north and south sides and the Cedar River dividing the city into east and west relatively. Mays Island, as well as the area outside of Cedar Rapids, are the only places in the city that do not have quadrant in their addresses. The city has 14 ZIP codes. Mays Island is marked with 52401; the northeast quadrant with 52402 and 52411; the southeast quadrant with 52403. Meanwhile, the southwest quadrant covers the area with the 52404 ZIP code; the northwest quadrant is marked with 52405. 12 neighborhood associations are lying nearby Cedar Rapids. The nearest ones are Wellington Heights and Oakhill Jackson in the southeast quadrant and Moundview in the northeast quadrant. 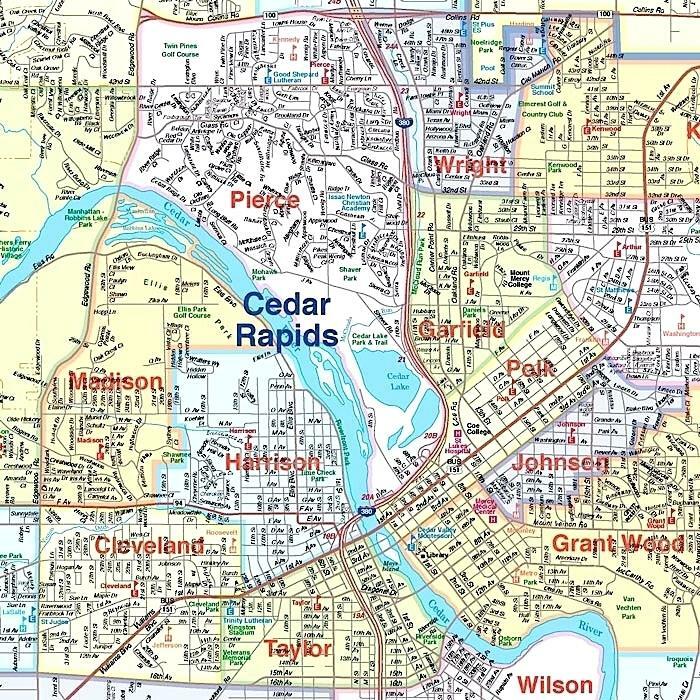 After Noelridge Park and Kenwood Park were incorporated into the Cedar Rapids city limits, those areas became the neighborhood association of Cedar Rapids near the northeastern quadrant as well. Vernon Heights, Stoney Point, Bowman Woods, New Bohemia (NewBo) and Wilderness Estates are considered the unofficial neighborhoods. One of the areas that might be highlighted in the city is Czech Village that is located south of the Cedar River along 16th Avenue Avenue SW. That is the home for Sykora Bakery, The Czech Cottage, and White Lion Treasures, all of the Czech-themed business in Cedar Rapids. The National Czech & Slovak Museum, as well as Bohemian National Cemetery, might be fascinating for tourists to visit while being in Cedar Rapids. The Cedar Rapids, Czech Heritage Foundation, has been sponsoring lots of events and organizations that are targeted to promote and preserve Czech culture in Cedar Rapids. In 2003, the city opened its ‘arms' for the African-American Historical Museum and Cultural Center of Iowa. Another interesting site in Cedar Rapids might be a 26-acre (105.000 square meters) estate in the heart of the city called Brucemore Estate. That is a 21-room mansion built by Caroline Sinclair between 1884 and 1885 with the formal garden, a children's garden, pond, orchard, night garden, etc. City Rapids is also known for its 13-kilometer city-owned property for the recreational use and undeveloped green space. The area concludes about 74 parks and recreational facilities with reach flora and fauna that also offers a 39-kilometer walking and cycling track. The city was ranked as one of the ‘Top 10 cities to Grow Up In' in 2009 due to its well-developed educational sector and low level of crime. There are two four-year colleges located in the city: Coe College founded in 1851 and Mount Mercy University founded in 1928 relatively. The University of Iowa has opened a branch in Cedar Rapids as well offering an evening MBA faculty for students. The only two-year college available at this area is Kirkwood Community College founded in 1966 and has additional campuses in Iowa City, Belle Plaine, Monticello, Marion, Venton, Tipton, Williamsburg, and Washington. Kaplan University/Hamilton College founded in 1937 and Upper Iowa University established in 1857 have campuses in Cedar Rapids as well. The city hosts several private schools such as: Cedar Valley Christian School, Summit Schools, Faith Christian Learning Center, Isaac Newton Christian Academy, Trinity Lutheran School, and Good Shepherd Lutheran School of the WELS. Cedar Rapids is an economic center of the Iowa state. Moreover, that is one of the largest corn-processing cities in the world. The corn and agricultural sector, in general, provides 4.000 jobs directly and 8.000 jobs indirectly. The information technology systems company Rockwell Collins, CRST International freight company, and the multinational insurance company Aegon headquarters are located in Cedar Rapids. One of the most significant American food conglomerate Quaker Oats headquarters is located at the northern side of the city. Among other large companies that are having their business and trading centers in Cedar Rapids are General Mills, Cargill, Toyota Financial Services, Archer Daniels Midland, and Nordstrom. The city offers a wide range of cultural and art sites as it has quite a far-going heritage that has started in 1838 when the first permanent settler Osgood Shepherd has arrived there. Among places that are worth visiting when in Cedar Rapids are the Paramount Theatre, Brucemore, Orchestra Iowa, Cedar Rapids Opera Theatre, Theatre Cedar Rapids, and a National Trust Historic Site. The Cedar Rapids Museum of Art is one of the leading cultural destinations of the city. The museum was established in 1905 and holds an impressive collection of Iowa artists' paintings. Among painters whose works are presented in the museum, there are Bertha Jaques, Grant Wood, Marvin Cone, and Mauricio Lasansky. The National Czech & Slovak Museum & Library was established in 1974 and covers the Czech heritage and culture. The flood severely damaged the museum and library in 2008 and, therefore, was rebuilt and opened again in 2012. The legendary Grant Wood studio is located at 5 Turner Alley and is dedicated to the art and works of the painter. Grant Wood was a talented American painter that was depicting American Gothic and rural American Wild West which was a significant flow in the 20th century. The U.S. Cellular Center or Five Seasons Center is located at the downtown of the city and is considered the multi-purpose arena that hosts concerts, presentations, conferences, etc. The arena was opened in 1979 with the approval of the voter referendum.